The government of Lao PDR has decided to establish the country as “the battery of Asia” by developing major hydropower dams along the Mekong River. The recent collapse of the Xe Pian -Xe Namnoy dam, however, which flooded numerous villages and generated high death tolls, accentuated once again the many risks of such projects. With nearly 40 per cent of the total volume of the Mekong River in the country, the government of Lao PDR has decided to establish the country as “the battery of Asia” by developing a series of major hydropower dams along the Mekong River, with a view toward exporting surplus power to neighbouring countries. The World Bank and the Asian Development Bank (ADB) are key influential players that have since the beginning backed up the neoliberal policies for dam development in Laos. Increasingly, the flow and interconnection of ecological live spaces and cycles as well as ancient local economies and cultural heritages are being blocked and diverted by dams. This has created already in many cases irreparable damage. An account of the environmental and social impacts of dam projects in Laos showed how these projects led to the migration of people, from dozens to thousands, who lost their livelihoods and cultures and were then forced to earn a living in new trades completely strange to them. 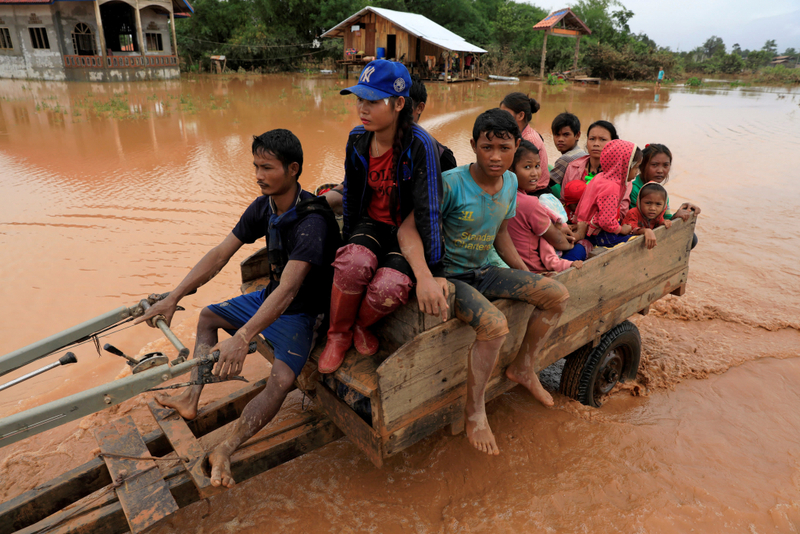 (3) Adding to this, the recent collapse of the Xe Pian -Xe Namnoy Hydropower dam in Southern Laos, which flooded numerous villages and generated high death tolls, accentuated the many other risks of such projects. The Xe Pian – Xe Namnoy dam: who is behind? Located in southern Laos, on the Bolaven plateau, the Xe Pian – Xe Namnoy Hydropower dam was built on the rivers that flow to Sekong, one of the major tributaries of the Mekong River. The project dates back to June 1993, when the Thai and Laotian governments signed a memorandum of understanding on the trade of 1.5 million kilowatts (kW) of electricity. The following year, Dong-A E&C, a Korean company, signed a contract with the Laotian government to develop a hydropower plant, with a total investment of US 498.41 million dollars. The South Korean Ministry of Strategy and Finance (MOSF) provided part of the required financial resources to its Economic Development and Cooperation Fund (EDCF) for developing the dam. The Dong-A Group, however, went bankrupt in May 1998, shortly after the outbreak of the Asian Financial Crisis, and its subsidiary, Dong-A E&C, also filed for bankruptcy in November 2000. This left the dam project in an indefinite halt. The consortium advertised that the hydropower dam, capable of 410 MW of electricity after completion, would generate handsome profits for the next 27 years by exporting its product to the Thai Ratchaburi Electricity Generating Holding power company. The ads, however, avoid mentioning that indigenous people were forced again to leave their livelihoods as well as the many social and environmental risks that such a dam holds. The indigenous Nyaheun people, who populated the area to be flooded by the Xe Pian -Xe Namnoy Dam Project, used to be self-sufficient; harvesting enough rice from their land, while the nearby river and forests also provided them with food and water. When Dong-A E&C’s project failed two decades ago, the Nyaheun began to return to their home villages. However, when the construction resumed, they were again forced to leave. Moreover, Cambodian villages around the lower Mekong, for example, already experienced abrupt changes in water volumes, rapid decreases and changes in the amounts and species of fish available for fishing, and the dramatic change in the way of life (including the necessary fixings on the structures of houses in response to sudden changes in water volumes) at the time the report was being written. These villagers have been experiencing such rapid changes all in the last decade since the construction of the dam was commenced in full force. Even more worrisome is the fact that these environmental changes have translated into an increasing detriment of food sovereignty. While being under construction, on July 23, the top of a saddle dam installed at one of the reservoirs of the Xe-Pian – Xe-Namnoy hydropower project collapsed, releasing a massive amount of water. As a result, six villages located downstream were inundated, while 13 other villages were also affected by severe flooding. As this dam construction was under a transboundary tributary of the Mekong River, the heavy flow of water also reached into Cambodia, causing damage to boarder communities in the Stung Treng Province. (8). The tragedy caused more than 30 people being dead, hundreds of missing people and uncountable loss of households and livelihoods. The bottom line is that mega dams are not new to controversy and environmental and social disasters, so why do dam-building plans in the Mekong River and elsewhere continue despite urgent calls to prevent their detrimental impacts? (1) Mekong Eye, Laos expects to have 100 hydropower plants by 2020, July 2017. (2) Green W. and Baird, I (2016) Capitalizing on Compensation: Hydropower resettlement and the commodification and decommodification of nature-society relations in Southern Laos, Annals of the American Association of Geographers. (3) International Rivers, Power Surge: The Impacts of Rapid Dam Development in Laos, 2008. (5) Mekong Watch, Grave damage caused by dam collapse in southern Laos, July, 2018. (9) New Delhi Times, Water Experts Question World Bank’s role in Laos Dam, October 2018.